If you have read my ABOUT ME page, then you already know why I have this Bloggers Tech blog. So to serve the purpose, and since I'm way too puzzled which topic and which tutorial I should have first - not to mention my hectic schedule. But anyway, I was able to think of this idea (and I don't know why I just thought of this now) that I would like to call THE PRO BONO. You might have heard of this word from lawyers or TV series (with lawyers - like Drop Dead Diva), and yes I do think it's also applicable in this idea on my head. Pro Bono is actually a term that is in short for the Latin "pro bono publico" which means "for the public good." but then it generally refers to free services that a professional provides to poverty-stricken clients, non-profit groups or charitable organizations - which I believe (or I think) in some countries, they required to have. And I would guess, you guessed it right. I'll be having A TOTALLY FREE SERVICE to offer my FELLOW BLOGGERS (ONLY) since I know not all of you are techie enough to fix some issues on your blog or want to have something on your blog. But of course, there are some terms and conditions that you must agree with. I can't be totally specific on what and where I could help. As you may know, I'm a graduate and carrying a degree in B.S. Information Technology - so most likely I know how to fix your website, your blog, I understand the programming language, etc. So I think it would be best if you just message me your problem, and if I could help and willing to include you on my PRO BONO then you'll surely will hear from me. By filling up the form below, it does not guarantee that you'll be included in the Pro Bono of Bloggers Tech blog. Bloggers Tech Pro Bono can only be claimed once a year. So if you have another problem, consult it next year. There are a lot of people who also needs my free service and I need to work also. Bloggers Tech Pro Bono does not mean I'LL SOLVE EVERY SINGLE ISSUE that you have on your blog. Ones you're included and accepted in this segment, you'll only allowed to consult and have one (1) to two (2) issues to be solved - depending on how it will take. Maximum time to be spend must only be 1 hour. Bloggers Tech Pro Bono is FREE of charge. No fees.But will just entertain and fix the problem that you've stated. Bloggers Tech Pro Bono service and the blogger is not responsible for any issues that you may encounter that is BEYOND or NOT IN the scope of the Pro Bono. E.g. The issue solved is your blog comment area, if there's an issue in the content or other areas. Bloggers Tech has the right to reject or cancel the service if the blogger and Bloggers Tech have some issues. The Blogger (blog owner) must agree to give access to the blog and tools if needed. If you don't want to give an access, and have an issue on your blog that you want to be fix, how can I fix it? The Blogger (blog owner) must agree to have the problem solving to be recorded. In this way, if there are any other fellow bloggers that have the same issue, it will serve as a tutorial on Bloggers Tech blog. The Blogger (blog owner) will have its blog name, blogger name and a link to your blog when you are accepted to have the Pro Bono. As I've mentioned above, THIS IS NOT MY FIRST TIME. I spend some of my time on Facebook groups and some of the fellow bloggers have these issues on their blogs and needed help - so I volunteer to help them out. I can't keep track of everyone who I've helped but here are some of them who wants to share their experience with me... and again this is FREE. Met her in an FB Bloggers group and from her profile I came to know she is an IT expert with the technical know how, someone I need to help me with my blog. I was a new blogger then and having difficulty how I should properly install those weird widgets like FB share, like, tweets so that I can join blog syndication and be able to promote my blog posts. I PM her with regards to my inquiry asked her how much she will going to charged me? She immediately replied and told me that it can easily be done and most important of all she will be doing it for me for FREE. Wow! she's a real great gal, someone I didn't know personally at all but here she is willing to help me at NO COST at all. She told me that I just need to make her admin of my blog so that she can fix everything. That's it, after a few more minutes, its all done. My blog was fixed. So, personally I owe her a lot for what she did to me. Since then I was able to promote my blog posts very well, joined syndication and earned my PR1. Thanks to Ms. Gay Aida Dumaguing. Why I'm Doing the PRO BONO? The Feeling of Helping. Being able to help someone who's helpless or at least needed help is PRICELESS. The joy you bring to them, is als o the joy you bring to yourself. It feels good you know. Bloggers Tech Tutorial. Since we'll be recording the whole thing, it will be also posted on the blog as a tutorial so surely, a lot of people will also learn from this - probably not right away but in the future there might be also people who'll find it useful. I've got a content, I've got a video, it's all in one blow - right? Learning from the Mistakes. As a programmer, I've been trained not to do the TRIAL AND ERROR method, meaning you code the project, make it run, if there's an error fix it. We could do that, I do that but I believe it's much more better to run it with less error. So learning and knowing how to solve these issues you have, may also help me know in the future on how to solve the problems. But this time, it will not only be me who'll be learning but also the others who'll be watching the tutorial and the people in the future. Above is my top reasons, and I hope it's enough for you to know why I'm doing this. Remember, my clients pay me with a minimum of $5 in one hour but yours is totally for free. 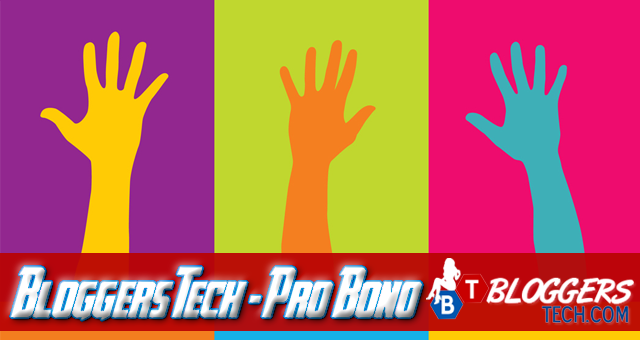 How to Apply for the Bloggers Tech Pro Bono? Simple, just fill out the form below. Be as thorough as you can so I don't have to e-mail you and ask what it is all about and in the end you're not accepted. Convince me that you need help, so if your reason is that you don't have time to do it - please don't give me that. Lastly, you may request a tutorial, though I've got a lot of ideas on my mind, so in this way I would know what you need and still be able to help out. Just use the contact page to request a tutorial.